Terminations are difficult on both a personal and professional level...how can you protect your company from litigation, while at the same time fostering a productive workforce? 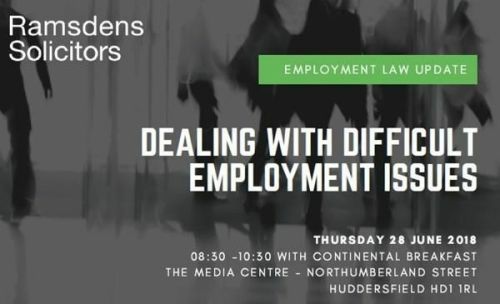 At our upcoming Employment Law Update Ramsdens specialist and experienced Employment Law team will discuss the do's and don'ts of how to handle tricky termination issues and provide expert and practical guidance at this free to attend seminar. If you'd like to book a place at this update you can do so by clicking here, you can also email rachael.sulley@ramsdens.co.uk or call 01484 558 099 if you'd like further information.